Students in their third year of professional education at the College of Veterinary Medicine will receive their White Coat in a ceremony held on Saturday, Jan. 28, on the CVM campus. 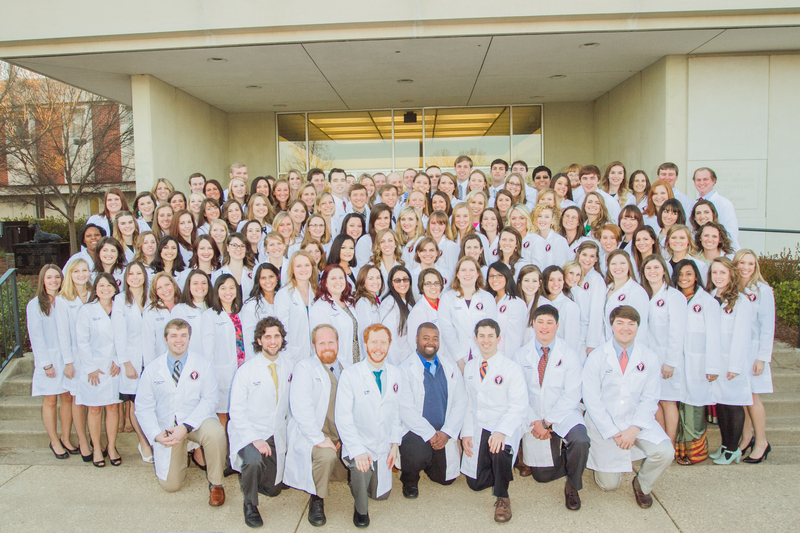 A group photo of the Class of 2017 when they received their White Coats in 2016. The White Coat Ceremony provides students a symbolic transition from classroom study to the clinical phase of veterinary education. The white lab coat is a symbol of medical professionalism and marks a turning point in the education of the 123-member class of 2018. Attending the ceremony will be friends, family and guests of the students as well as representatives from the Alabama Veterinary Medical Association, the Kentucky Veterinary Medical Association and the Tuskegee University School of Veterinary Medicine. Attendees are invited to attend a reception and tours of the College of Veterinary Medicine prior to the 3 p.m. ceremony. Guests and students will be welcomed by Dean Calvin Johnson before the presentation of the coats led by Dr. Dan Givens, associate dean for Academic Affairs at the College of Veterinary Medicine. Closing remarks will be given by Maggie Thompson, president of the class of 2018. — Written by Caroline Holder.